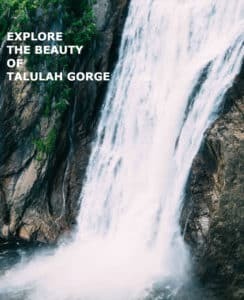 Defined by a 1,000-foot chasm and five waterfalls that cascade through it, Tallulah Gorge is one of the prettiest little towns in all of the Northeast Georgia Mountains. Do yourself a favor, and after breakfast some morning, take the 30-minute drive over to see it. In the beginning of the 20th Century, Tallulah Falls was a bustling resort town, the South’s version of Niagara Falls. At one point there were 17 boarding houses and hotels, each vying for the throngs of tourists who were coming to see the stunning natural beauty. In 1886 history was made when a thrill-seeker crossed the deep gorge on a high wire, a feat repeated in 1970 by the legendary Karl Walenda. But the town also had its trials, most notably a massive fire in 1921 that destroyed the hotels, stores, and many homes. Today visitors are returning, discovering the charms of a town that is at the heart of Tallulah Gorge State Park. It is a gorgeous outdoor paradise that offers fishing and boating on three pristine lakes and hiking trails throughout the park. Mountain bikers come to ride the challenging 7-mile park trail and others bring a picnic, preferring to sit back and soak it all in. Tallulah Falls is quintessential small town, with an extra dose of beauty. Enjoy walking its streets, stopping into one of its touristy shops. If you catch whiffs of barbecue, chances are it’s coming from Overlook BBQ, a good little dive that hickory-smokes its own meats, turning out tried-and-true Southern bbq. Two noteworthy events offer even more reason to visit the town—one drawing world-class kayakers, the other a holiday tradition. Five times a year the Georgia Power Company releases extra water over Tallulah Dam and top kayakers take on the challenge. This festive evening includes a potluck dinner, hayride, caroling around a bonfire, and the ceremonial lighting of the area’s only floating tree. Driving to and from Tallulah Falls is also a joy, as it’s hard to beat our beautiful mountain scenery. And the nice thing is, you can keep on enjoying all that beauty right back here at Lucille’s! This entry was posted in Georgia Mountain town, Georgian Mountain Festival, Mountain activity, Scenic drives and tagged Georgia Mountain Activities, Mountain Trails, North Georgia Mountains by admin. Bookmark the permalink.